With all the hours you spend in bed you depend on comfort to make sure you get a good night’s sleep. Imagine how much cozier it would be to settle in against the softest sheets you ever felt! Recently, I got to experience the pleasure of climbing into bed with a set of 1500 Thread Count 100% Egyptian Cotton Luxury Sheets that I was sent to review. Let me tell you how spoiled you will become once your body cuddles up against these silky soft sheets with a lustrous finish. You’ll just want to crawl into bed earlier and linger longer in this luxury bedding. What else was nice about this luxury bedding was how easy it is to care for them. All you need to do is wash them in cold water with items of similar colors, then tumble dry on low heat. No need to bleach, dry clean or iron these babies! Even after initially washing them, the color stays true and wrinkle free like my vivid green set due to their remarkable high strength micro fiber yarns. You can select from thirteen shades to match your own decor. Each set comes with a flat sheet, fitted sheet with deep fitted pockets from 15″ to 18″, and two pillow cases. Trust me, you would expect a set of this quality would be much higher priced. But 1500 Threads wants people to get acquainted and offers a 50% discount of your total price at checkout if you use NUTS4STUFF50. They’re even offering free shipping when you buy two items or more right now to make it even sweeter for you to try their luxury bedding. 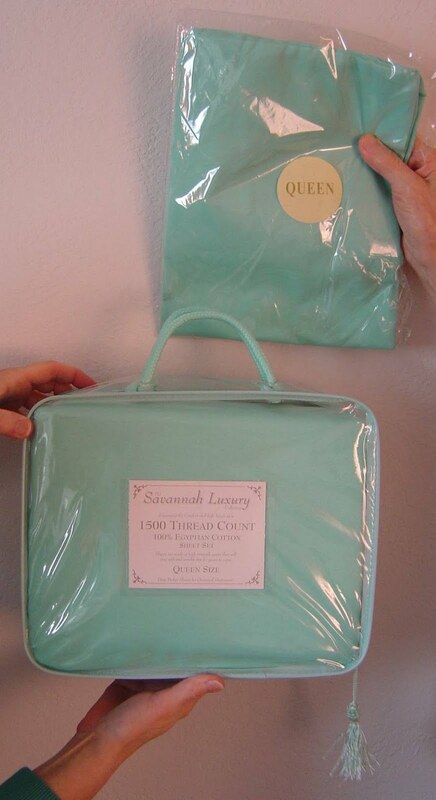 Become a fan of 1500 Threads on facebook and discover other great deals when they become available. I agree that luxury bedding is a must for the bedroom. The elegant and luxurious feel is a must for everyone. I recently purchased luxury bedding for myself and agree with what you are saying.